On Sunday June 19, 2016, Majestic Cycling hosted the Victorville Criterium around the main streets of City Hall. The event was once again held under some very serious heat which made the race tough and challenging and trying to keep cool on the day would play a big factor. The race course was absolutely awesome with six corners with big wide roads on good tarmac. This was not your usual four corner industrial park criterium! This course was fast and very flowing! The Pro 1,2 race started off fast from the gun with attacks going off the front of the group. The field was getting smaller as each lap passed due to the heat and fatigue. Around 20 minutes in, a breakaway of four riders established themselves off the front of the group, which included Wesley Eslick (SoCalCycling.com Team), Daniel Willet (LUX Development Cycling,) Vincent Gonzales (TRU Cycling) and James Stocker (SC Velo). The main break was working really well together with the guys taking feeds with nice cold bottles on the laps to try keep the core temperature down. Once we had a nice rhythm going there were a couple of attacks to try get the breakaway spit up but nothing was to go. All four of us wanted that win! With a lap to go James Stocker (SC Velo) put in a small attack to try to gap himself off of the three of us, but we were onto him straight away. Coming out of the last turn James Stocker (SC Velo) was leading it out, which forced me to just jump that tad bit to early. Daniel Willet (LUX Development Cycling) started coming around the right hand side of me and he just grabbed the win with myself, Wesley Eslick (SoCalCycling.com Team)taking 2nd and Vincent Gonzales (TRU Cycling) taking 3rd to fill out the podium. Majestic Cycling did a fantastic job to get this event going this year and I definitely think the Victorville Road Race and Victorville Criterium had some very good courses, so I am excited for next year. 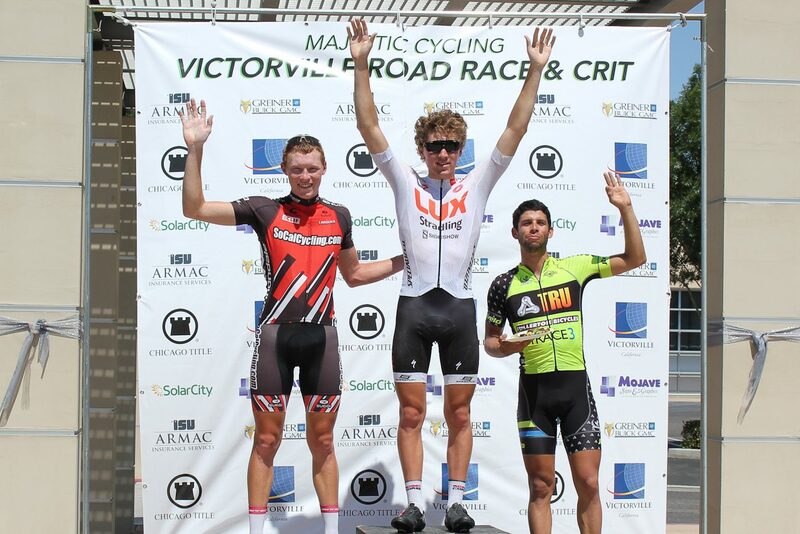 Be sure to put the Victorville Road Race and Criterium on your racing calendar! Thanks again to all of the SoCalCycling.com Team sponsors for making it possible to race at these events.